Author Ingrid JendrzejewskiPublished on 26 June 2015 1 Comment on Happy National Flash-Fiction Day 2015! It's all happening, on this Day of Flash. Well, here it finally as. After months of frenetic preparation the day has arrived. This is the 4th National Flash-Fiction Day. The 1st happened in 2012 and featured a book, an online journal, and a host of events. Since then, it;s got bigger and better and more and more people have been involved. Next year will be our 5th, so we need to think of something special to mark the occasion, but for now, here's your run down of what's happening today. First, as soon as you've read this why not head over to our Facebook page or our Twitter feed to check out the stories coming thick and fast from the FlashFlood journal? There is one every 10 minutes for the whole day, a total of 144 fabulous stories. And if you're rather write than read, then The Write-In is open once again, for one day only. So get scribbling! 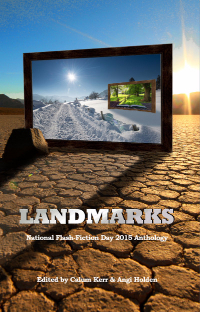 If that's not enough, our new anthology, Landmarks, is now available in paperback from Amazon for a special NFFD price of just £5.99 (usually £7.99). It's also available on Kindle for just 99p. In addition, you can get the following Kindle books FREE or DISCOUNTED for today! Quick Change by Debbie Young. If that wasn't enough, there are actual real events happening all over the place! There are too many to mention here, so go to our Events Calendar to see what's happening, and maybe pop along to something near you, or take part in one of the online events. I will be attending the FREE workshop, FREE Foyles reading and (sadly not free) drinks events in Bristol again this year. If you can, why not come along and say 'Hi'. I will be weighed down by copies of Landmarks, so you can always pick up yours there. I'd like to take this chance to say a quick thank you to the judges from our Competition: Cathy Bryant, Cathy Lennon, Angela Readman, Kevlin Henney, Tim Stevenson and Jon Pinnock; Angi Holden for co-editing the anthology; Amy Mackelden, Tino Prinzi and Tim Stevenson for all their behind-the-scenes work; my co-editors of FlashFlood: Susi, Shirley, Annette, Cassandra, Susan and Caroline. And to everyone else who has pitched in, organised an event, written a story, retweeted a bit of news, or whatever. And special thanks to Kath, my wife, for putting up with all the tantrums it takes me to get this day organised. You are all stars, fairies, unicorns, or otherwise mythical beasts of your choice. Whatever you're doing today, I hope you have a wonderful time. National Flash-Fiction is such a celebration of the short short story, and it's all for you. Published on 26 June 2015 Author Ingrid JendrzejewskiCategories News1 Comment on Happy National Flash-Fiction Day 2015! Author Ingrid JendrzejewskiPublished on 26 June 2015 1 Comment on Did you hear that? Published on 26 June 2015 Author Ingrid JendrzejewskiCategories News1 Comment on Did you hear that? Author Ingrid JendrzejewskiPublished on 17 June 2015 2 Comments on Presenting… Landmarks. Our 2015 anthology now has a name and a face. It is called Landmarks,and we owe our thanks to Ian Shine for letting us borrow the name. Published on 17 June 2015 Author Ingrid JendrzejewskiCategories News2 Comments on Presenting… Landmarks. Congratulations to all who made it in. Commiserations to those who were unsuccessful. We are currently working on the title and the cover, and those will be announced as soon as can be! Thanks to all who took part, to Angi for helping to select the stories, and to Amy and Tino for their amazing work. Published on 3 June 2015 Author Ingrid JendrzejewskiCategories News2 Comments on NFFD Micro-Fiction Competition Winners! Well, the judges have been doing their thing, and we are close to being able to announce our top 10 and our winner! But just to get you in the mood, here is our longlist of 25. I will only post the titles at the moment, but you'll know who you are. Final announcement of the top ten will be out soon. Well done to everyone who entered. A hard job for the judges as ever.